Welcome to the Enclave at Rapallo! 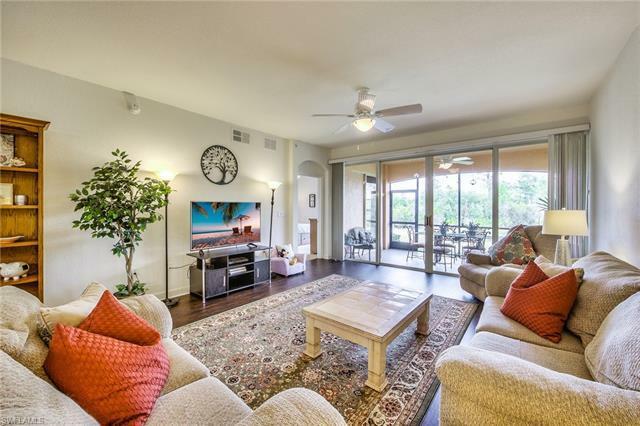 This ground floor, 3 bedrooms, 2-bathroom condo offers over 1600 square feet of entertaining pleasure with its peaceful lake and preserve views. The private location of this popular Tellaro I floor plan is perfect for nature lovers & wildlife watchers alike. Grab your binoculars & watch the spoonbills, crane, otter, rabbits & more from your spacious lanai. Inside, the kitchen offers upgraded cabinetry, quartz counters and breakfast bar all overlooking the comfortable great room space featuring newly installed vinyl hardwood flooring. Your master suite offers 2 large closets, a slider to the lanai & an en suite bathroom with dual sinks & walk-in shower. Rapallo is within walking distance to everything that the expansive Coconut Point area has to offer. Feel like going for a swim? Use the amenities in the Enclave or walk across the nature preserve boardwalk to the main clubhouse. Lagoon pools, Olympic lap pool, fitness center, arts & learning studio, tennis, stocked lakes, bocce, and botanical gardens are just a peek into what makes Rapallo so special - Take time for yourself, this is paradise - relax, reflect, recharge.